Investment certificates meant to finance a project to extend the Suez Canal will be issued on Thursday, state-owned Al-Ahram newspaper reported. 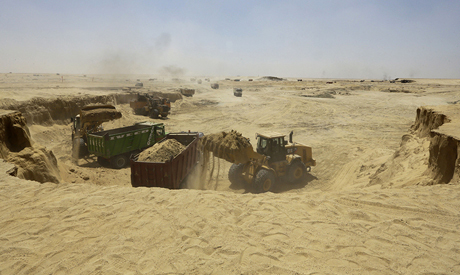 Earlier this month, Egypt started digging a 72 kilometre waterway parallel to the Suez Canal, with the aim of increasing the capacity of the vital international shipping route. State-owned entities Bank Misr, the National Bank of Egypt, Banque du Caire, and the Suez Canal Bank will issue the certificates, which other banks will be able to order for customers upon request. The issuance of the certificates was pending a final ratification of the relevant law which took effect on Tuesday. The certificates will be issued at a value of LE10, LE100, LE1000 and its multiples, with a maturity of five years at a 12 percent interest rate. The low value certificates, worth LE10 and LE100, will be redeemable with cumulative interest, at the end of the five years, while holders of certificates worth LE1000 and its multiples will reap a 12 percent interest on a quarterly basis. The finance ministry is guaranteeing the certificates, which will be repaid from Suez Canal revenues. In August, the canal achieved historical monthly record revenues of $508 million, said Mohab Mamesh, head of the canal authority, as cited by state-run news agency MENA on Wednesday. During his visit to Egypt, Roberto Azevedo, director general of the World Trade Organisation, said the organisation supported the project as he expected it to add value to world trade.